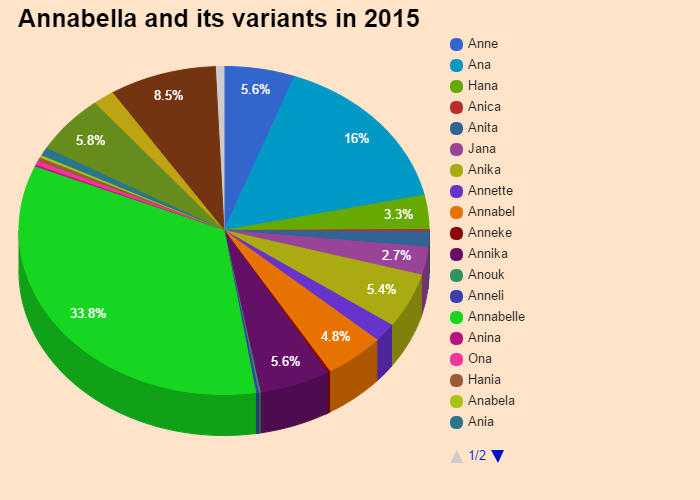 Annabella was ranked 366 in 2015 list of US girls name and dropped by 44.66% from its previous ranking of 253 in 2014. First name derived from Anne. Comes from the Hebrew "hannah" means "graceful" If party July 26.. Intelligent, extremely intuitive,Annabellajudge people a first glance and rarely wrong. Passionate, dynamic, voluntary, refusing mediocrity,Annabellaare somewhat authoritarian and possessive. Annabella do not lack heart qualities, devoting themselves lavishly. Their charm and kindness facilitate their success. Annabella is a rare first name for a girl in England & Wales which is a rare name since 1996 and ranked 296 in 2014. Only 1226 people have Annabella as their first name. Annabella is a very consistent name over the past 18 years. Annabella is a very very popular first name for a girl in United States which is popular since 2002 and ranked 366 (0.020596% bearer) in 2015 in US. Around 11256 people wear Annabella as their first name. Annabella is a rare first name for a girl in United States which is a rare name since 1912 and ranked 366 (0.020596% bearer) in 2015 in US. Only 11256 people have Annabella as their first name. Annabella is not a native United States and Annabella may be came from another language or is a short form of some other name. 0.003149% of people in US have this given name. Expression number of Annabella is 8. The classic girl name first appeared in 1912 when 5 babies had Annabella as their first name, the baby name went as low as 5 in 1919. 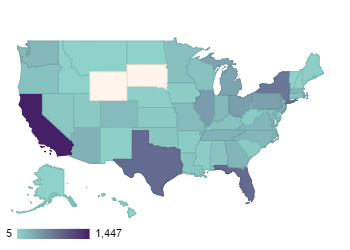 At peak, Annabella was given to 1270 (0.068%) girls in 2014 specifically in California where 174 babies were named Annabella after continuous rising. After it's 105 long run and having 16 instances of disappearance, Annabella is on a fall in the chart. Get the meaning of Annabella and celebrities who also shares the same name and some names related to Annabella, english baby names list, list of names in english. Know what does Annabella mean? This website serves as the extended english names list which will help in naming your child.